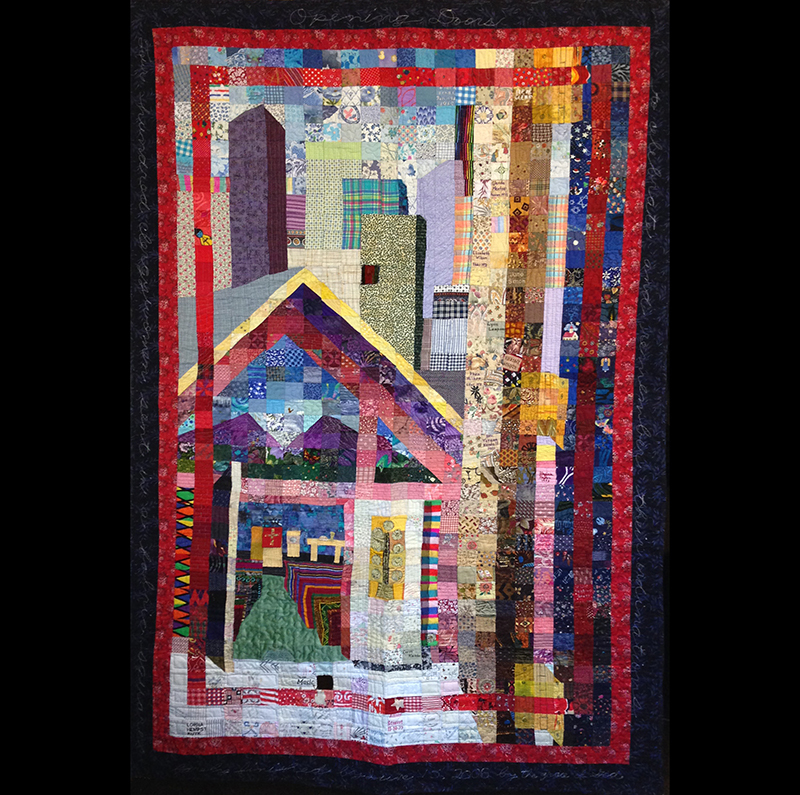 While focusing on women’s ordination, Susan wanted her quilts to show the service of all women in the Church. She began a letter writing campaign to congregations across the United States, inviting recipients to send her 2-inch x 2-inch squares of fabric. And send them they did. 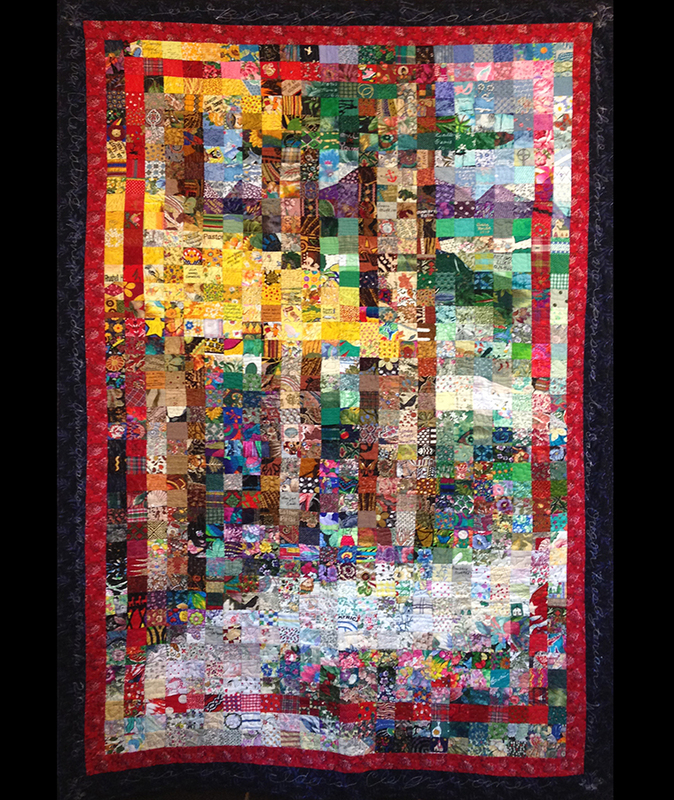 Susan received squares from over 1,000 churches, with some congregations shipping multiple swatches representing the diverse contributions women had made to their communities. Each square told a unique story. To name but a few: squares of Saedong, a traditional Korean fabric with vivid, colorful stripes; Mardi Gras-inspired fabrics honoring women pastors who ministered to those ravaged by Hurricane Katrina; African print squares honoring Arlene Gordon, an African American minister ordained in the PC(USA). With the arrival of so many squares in every color imaginable, many covered in flower, animal, or geometric patterns, Susan set out to arrange the pieces. 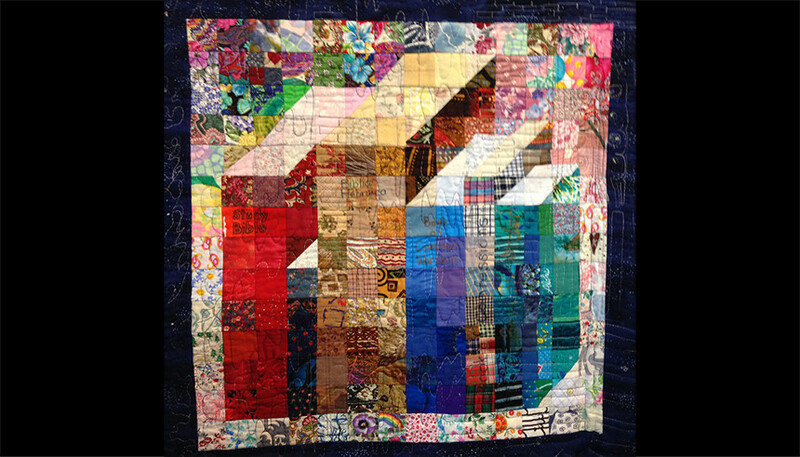 She did so by turning them into an artful witness to our community of faith, making three quilts each celebrating women’s ordination anniversaries: 50 years as clergy, 75 years as elders, and 100 years as deacons. “Opening Doors” honors the first generation of women who became deacons and elders, and in the process opened doors for the first female clergy. 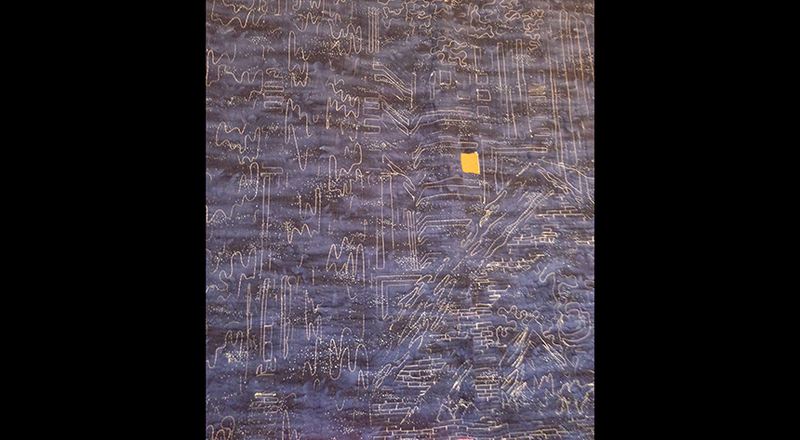 Viewing the quilt as a whole, you look through an open door into a church, a city skyline behind. 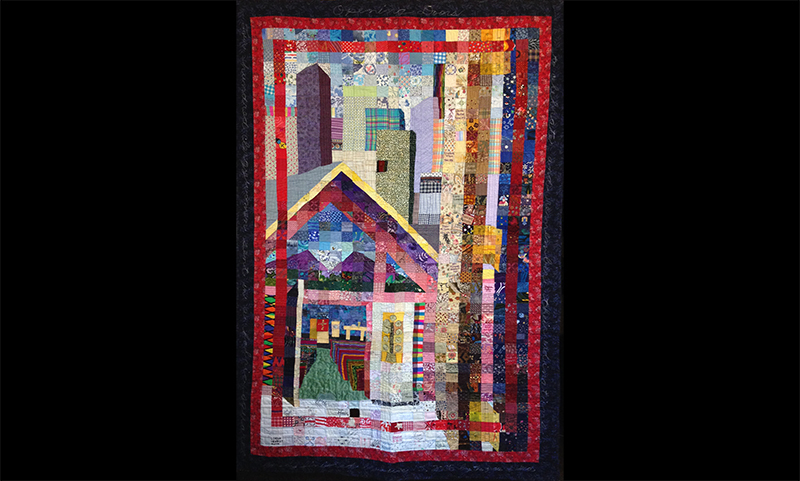 On the back of “Opening Doors” fabric squares form a clergy library depicting resources that feed the faith. Clergy library stitched on the back of "Opening Doors"
“Building Bridges” came from a remark the Reverend Eileen Linder made to Susan: “We were slow to build bridges with our racial ethnic sisters, and I regret that.” As Susan explains it, the building of bridges is now an intentional, shared goal in the Presbyterian Church (U.S.A.). 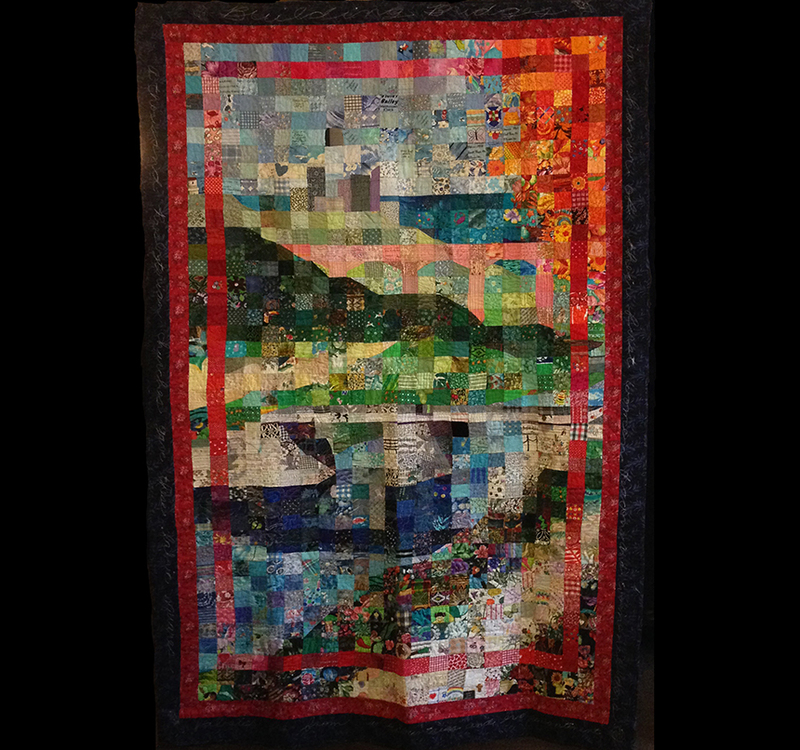 Looking at the full quilt, you see a bridge stretching across a river with a span of shadow below. The bridge depicted is a clapper style—a bridge common in Scotland, where so much Presbyterian heritage hails from. On the quilt’s reverse side is a Jerusalem cross. Jerusalem Cross on the back of "Building Bridges"
“Blazing Trails” depicts a trail leading through tamarack pines, across green fields, and into distant mountains. Tamaracks turn bright gold in the fall and drop their needles, which Native Americans used in medicine. High-heeled shoe prints follow the path, signifying how even trailblazing church women were expected to adhere to prescribed social constraints of femininity. 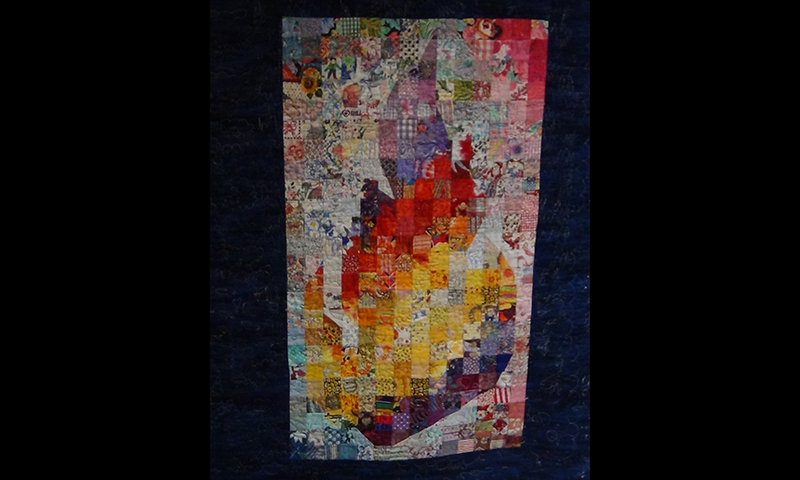 Flames on the back of "Blazing Trails"
 Women served as elders in the Presbyterian Church in the United States of America, or Northern Church, beginning in the 1930s and in the Presbyterian Church in the United States, or Southern Church, in the 1960s. Margaret Towner became the first female minister in the Northern Church in 1956; Rachel Henderlite was ordained as the first female minister of Word and Sacrament for the Southern Church in 1965. 2 hours 16 min ago. Happy #EarthDay from the Presbyterian Historical Society! Here is an image of the very first Earth Day in 1970 that comes from our collection of Religious News Service photographs. To view this image and read about the Presbyterian Church and it's involvement in environmental causes over the years, visit https://buff.ly/2GznHvN.